My brother in law will become father for the first time in April. I have the honour to be the godmather to his little baby girl, so I decided to do a set of cards which will announce her birth. The design paper is from Stampin' Up called "Sweet always", I only needed 2 12x12 for all 20 cards. 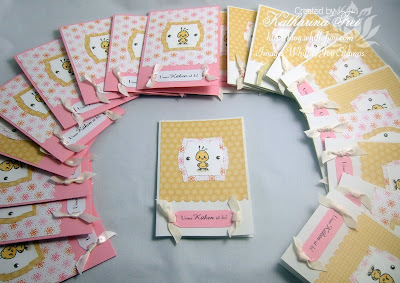 The base of 10 cards is whisper white cardstock, the base of the other 10 is pretty in pink cardstock from Stapmin' Up. Das Motivpapier ist von Stampin' Up "Sweet always", ich habe nur 2 Bögen 12x12 für alle 20 Karten gebraucht. 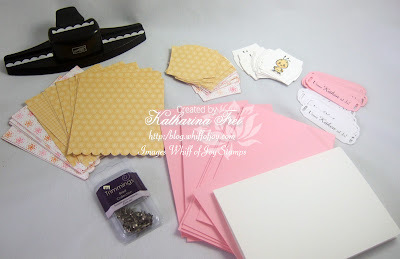 Die Basis für 10 Karten ist whisper white cardstock und für die anderen 10 pretty in pink cardstock von Stampin' Up. Ich habe Elisabeth Bell's süßes Küken von Whiff of Joy Stamps als zentrales Motiv gewählt, da es super für den Text paßte. Ausgestanzt habe ich es mit Spellbinders Lables 2 Nestabilities. Den Text habe ich am Computer designed und mit Spellbinders ribbon tags trio ausgestanzt. I also generated the inside on the computer. The parents can fill in the name, birthdate, birthtime, weight and size of their baby. I cut it with Spellbinders Lables 1 Nestabilities. The background is a Penny Black swirl, which I stamped with pink pirouette ink from SU. Das Innere der Karten habe ich ebenfalls am Computer generiert. Die Eltern können alle wichtigen Daten selbst ausfüllen wenn es soweit ist :) Ausgestanzt habe ich den Text mit Spellbinders Lables 1 Nestabilities. Die Hintergrundschnörkel sind von Penny Black, gestempelt mit pink pirouette ink von SU. I hope my brother in law likes the cards, we'll give them to him tonight, because it's his birthday. Ich hoffe, dass meinem Schwager die Karten gefallen. Er wird sieheute zu seinem Geburtstag bekommen. Paper: Stampin' Up cardstock whisper white & pretty in pink, dp "sweet always"
Was für eine arbeit. Die karte sind super geworden. BIn überzeugt das sie gefallen. Wow these are really cute! Your brother in law and the new mommy will love them! Looks like so much work! Katharina these are so sweet and personal. I am sure your brother and his wife will adore them! How could they not - you can tell they were made with LOVE! Beautiful cards Katharina!No doubt every recipient will be very impressed with a handmade card and that the proud parents will really appreciate the amount of thought and time you put into them.Well done! liebe Katharina deine karten sind wunderschoen geworden, da warst du super schnell. Beautiful gift, I'm sure he will love them, they look fab. woww Katharina what a beautiful cards. Katharina, these are absolutely adorable! I am sure the new parents will love them! These are very good!! I bet your brother will be so thrilled! They are absolutely adorable Katharina!!! I'm sure they will love and appreciate them! That little girl is so lucky to have YOU as her Godmother!!! 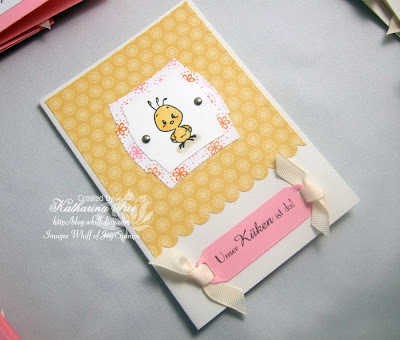 Ahhh, these birth announcement cards are sooooo adorable, Katharina! Such a fab use for this sweet WOJ image! I just may have to borrow it next time I'm needing a baby card, if ya don't mind,smile!!! Awww, Katharina, this is too, too cute! 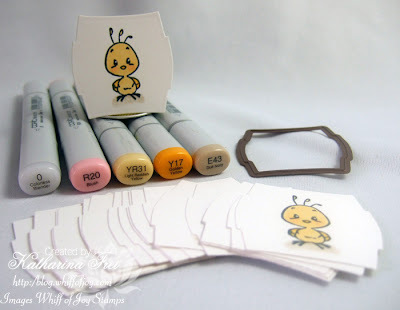 What a cleverly, wonderful idea and I just loove your cards using the sweet little Spring Chick! c'est adorable, et de saison avec ce petit poussin. Congrats Katharina for your gorgeous work!! Your cards are so sweet and the image is very cute!! I'm sure the parents love them!! Du meine Güte, so viel Arbeit.So herzig und süß sind die Karten geworden. Wunderschön. Wowwww, das sieht aber gut aus. Sie sind super schön geworden. Oh these are so gorgeous he will be so happy that you made these! Da kommt eine tolle Zeit auf Dich zu! Die Kartenidee ist spitze und suuuper umgesetzt. Respekt! BEautiful cards Katharina, such a thoughtful and sweet gift for the new parents! They are gorgeous Katharina and would have taken me twice as long to make! Well done. Wie suss! Die sind wonderschön! What fabulous cards and a lovely gesture for your brother and his wife! What sweet of you Katharina. They are so cute! !